Perhaps one of the most polarising releases of 2014, Assassin’s Creed: Unity was met with a considerable backlash upon its October release. Hyped as the first truly next-gen release in Ubisoft’s annual series, it was marred by an incredible list of bugs which left gamers with emotions ranging from hilarity to anger. Characters faces vanished leaving just eyeballs and hair, Arno would fall through the floor and crashes were frequent. However, Ubisoft have admirably worked to fix these issues, leaving it much more polished than before. On its own terms, Unity is an interesting mix of old and new which, sadly, doesn’t quite pan out. Unity’s story, for starters, is much more personal and focused. Here, we follow the journey of Arno, a brash young man whose assassin father is murdered right at the start. Arno’s journey takes him through a France in revolt, as he tries to find out the truth behind the murders of his father and adoptive father as he embraces the life of an assassin. However, personal conflictions arise as his lifelong childhood friend, Elise, is on opposite sides. As much a tale of revenge as one of love, it doesn’t quite benefit from interesting characters. 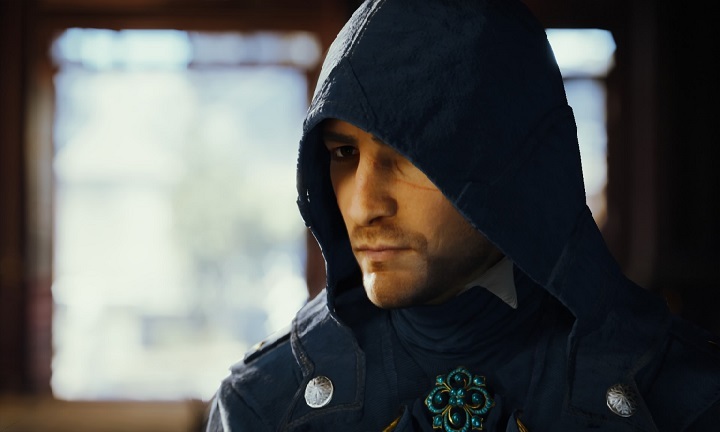 Arno tries to emulate the cheeky wit of Ezio, but ends up being a bit dull. The dark ending is certainly a change from the norm, but in the end, there’s not much memorable here. At first, this new Creed feels like somewhat of a step back. 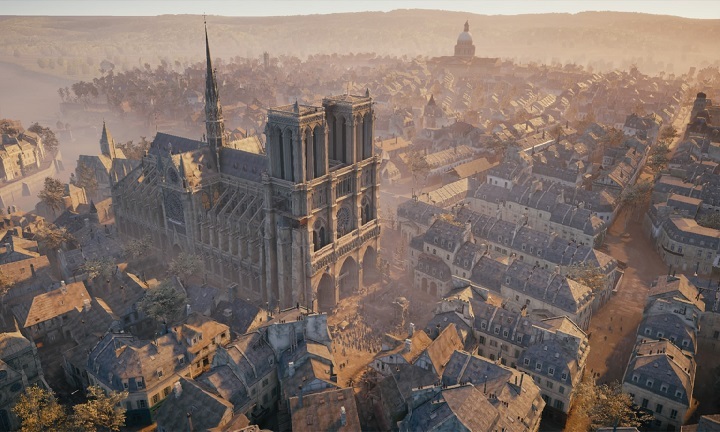 Instead of exploring the high seas of Black Flag, we’re confined to on-foot exploration in an admittedly beautiful, but also smaller, city of Paris, though you can also explore Versailles. That being said, the smaller scale does bring more confined detail, with a beautiful city filled with collectibles to find. The side content alone is so dense it could take an extra couple of dozen hours to finish, be it opening chests, collecting cockades or completing the various side missions, including murder mysteries and hunting clues in the Nostradamus missions. It’s almost too dense though, coming off as intimidating as the map is completely filled with side icons. Maybe a more spread-out map would have given to a bit of breathing room. The core mechanics of this series feel familiar, but do come with some refinement. Combat feels more like a fencing match, and increase in difficulty is certainly welcome. A new weapon called the Phantom Blade has been added, allowing you to kill targets from a distance using arrows, as well as poison and aggravate targets. 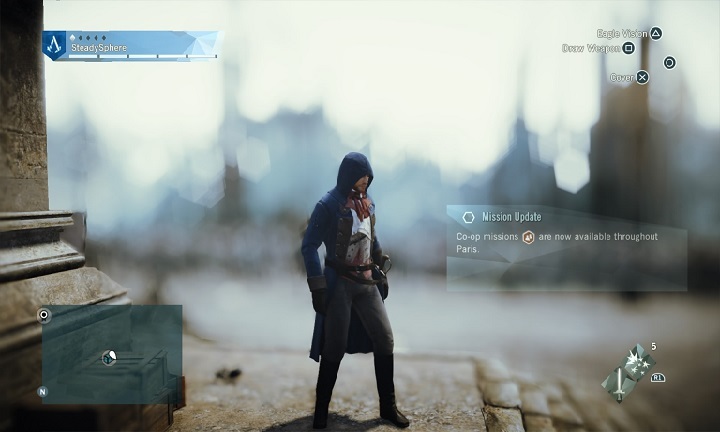 The other new addition is customisation, as now Arno can be upgraded using money and skill points. Weapons can be brought, whether it’s a long sword or axe, and Arno can be kitted out with armour and skills such as air assassinations. It certainly is interesting, though it can also be a source of frustration as missions remain exceedingly difficult until you grind out Arno’s stats and abilities. Perhaps the biggest hit taken from the removal of sailing is the mission design. Now, we see a return of a lot of missions which series vets have come to hate – tailing, following and other mostly uninteresting missions. That being said, some interesting points come from the extensive, well done Assassination missions. Here, a target is hidden in the area, and it’s up to you how you take them down. There’s no punishment for detection, giving a bit of flexibility to the proceedings. Several side objectives also allow you to gain the upper hand, such as freeing a group of prisoners who will then start a riot, giving you breathing room from guards. It would have been nice to be allowed to explore these, rather than have them marked on the map, but assassinations are still fun. It’s a shame that the rest of the game can be dull. Co-op also feels like a missed opportunity. It should be a tantalising prospect to play with three other assassins, but it’s worth noting that rather than playing through the story, specific missions have been made for co-op. They range from assassinations to heists, but neither presents much fun. 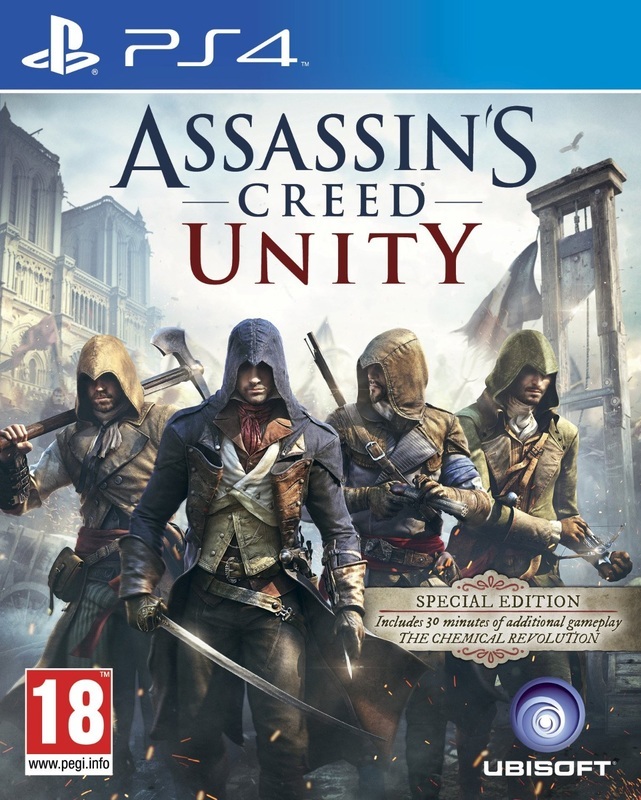 Rather than lean on the strengths of co-op modes – working as a collective group, opportunities for specific scenarios only multiple players can achieve and being a bit more of a challenge than your standard mode – Unity’s paltry co-op selection basically drops four assassins into a mission and doesn’t give them much opportunity. Heck, if you’re good enough, you can finish these missions by yourself, meaning co-op feels underwhelming. 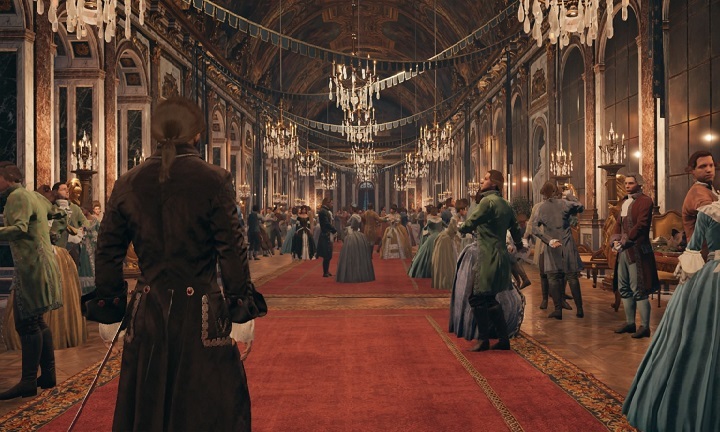 "I shall compare thee to a kiss from a rose..."
You have to credit Ubisoft for their ambition with Unity’s world, but it perhaps has exceeded their technical reach. When still, Unity is perhaps the most gorgeously-crafted AC game to date. The small, yet packed, world of Paris is a sight to behold, with beautiful architecture, detailed textures and subtle weather effects, such as moments of dense fog, which bring the world to life. Unfortunately, once you start moving, the game (even patched) struggles to keep up. With so many civilians packed into Paris, the game just can’t maintain a consistent frame rate, making the beautiful city suddenly feel choppy. Cutscenes come packed with insanely detailed, emotive characters but too suffer from choppiness. It’s just too much. The audio is mixed, featuring some excellent music combined with underwhelming acting and a middle-of-the-road script. It’s strange how inconsistent the Assassin’s Creed series can be. Going from the excellent, Game of the Year worthy Black Flag, Unity seems like a major step backwards. That being said, it still packs some of the appeal of the series, such as beautiful vistas, good parkour and stealth mechanics and lots of content to explore. And the Assassination missions are a nice change of pace. But these pluses are bogged down by dull mission design, technical woes and story issues. So in the end, fans of the series may still get their thrills from Unity’s free-roaming Paris, but otherwise, this one certainly won’t convert you if you aren’t part of the creed already.